If you don’t play well there is always the risk to arrive in a negative circle with bad results ad bad luck. Against Siena the team of Alberto Malesani played very good in the first 17 minutes and created some chances to open the score. In the 17th minute referee Tagliavento whistled for a dubious fall of our new young defender Alhassan. 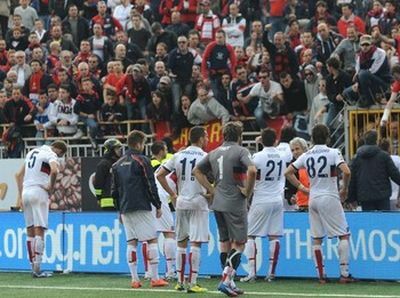 The freekick of Brienza touched the back of Gilardino and flew directly in the goal of Genoa: 0-1. Our players were shocked, how is this possible: we are the best team in the field, Siena did not even had a shot towards Sebastien Frey and now we are 0-1 down. Only 2 minutes later our rented player Mattia Destro scored the second goal of Siena: 0-2. Just before halftime Brienza scored 0-3 and just after the break Giorgi also scored 0-4. This was enough to a part of the Genoa-fans in Gradinato Nord who came towards Distinti and stopped the match with fireworks ad climbing on the fence. After 45 minutes discussion between the fans and the players Marco Rossi and Giuseppe Sculli the team of Siena and the referee including linesmen arrived again on the field and the last 37 minutes were played in a very strange atmosphere. Siena scored another time, but now in their own goal: 1-4. Because Lecce draw in Roma against Lazio they are now only 1 point behind us while Genoa has to play the last 2 homematches without public. Nobody believes that Alberto Malesani still will be our trainer tomorrow. 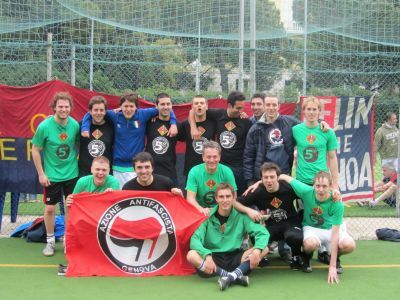 The fifth edition of United in the name of Genoa was (again) a great succes. Eigth teams (5 of Genova and 3 from Holland) played at the tennisfields of Le Palme in Genova, Albaro. The final at 18.00 hours was the same as last year Allunamanin agianst Gelateria le Stelle (Holland) and again the Italians did win the title with a 4-1 victory. After the tournament all the players went to Righi (the Dutch with the funicolare) to have a fantastic dinner with a spectacular view on the city-centre of Genova. We all thank Luca Carini for the fantastic organisation and already look forward to the 6th edition next year. The match Milan-Genoa is cancelled because of the death of 25 years old Piermario Morosini by a hartattack in the field during the match Pescara-Livorno. 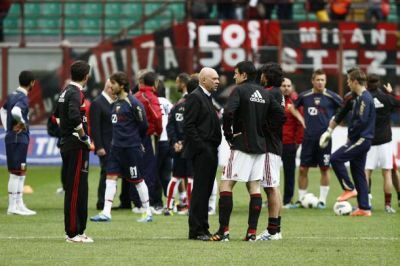 Genoa and Milan already had started their warming-up when the news about the death of the Livorno-player (Serie B) and the decision of the Italian Football Associciation to cancel all the matches of this weekend arrived. The next match of Genoa now will be: Genoa-Siena on Sunday 22nd April at 15.00 hours. 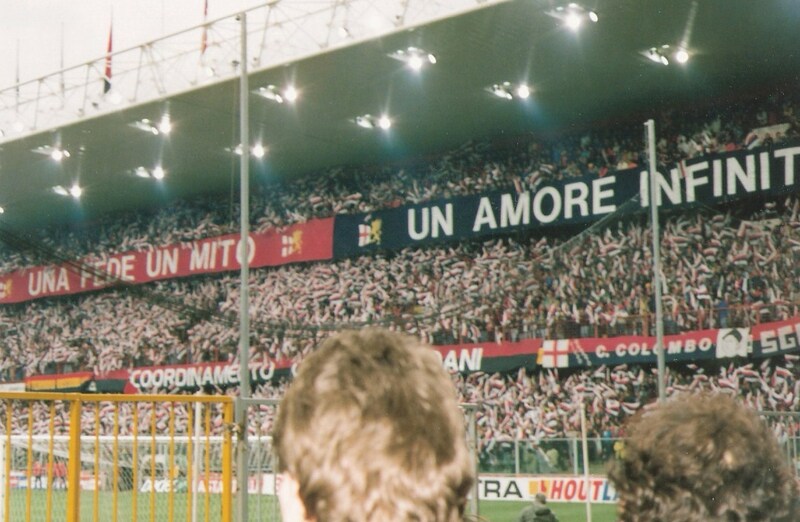 Genoa Club Amsterdam will be there for the first time since Genoa-Lazio on 5th February (last victory of Genoa!) to bring again 3 points to the team of Malesani. Because of the calcetto-tournament United in the name of Genoa on Saturday in Albaro 21 Dutch Rossoblu will arrive, a record for our fanclub! Till 15 minutes before the end everything was ok. Genoa was 1-0 ahead by a goal of Marco Rossi and Lecce was 1-0 down by a goal of Bergessio of Catania. In the last minutes everything changed: Mutu scored the equalizer in Luigi Ferraris just as Lecce on the island Sicily in the 88th minute. The goalkeeper of Catania protested against the goal of Lecce (offside ?!) and got his second yellow card, becaue Catania already substituted 3 times midfielder Lodi had to be the new keeper. In the 91st minute Di Michele also scored the winning goal to Lecce after a mistake of goalkeeper Lodi. In 15 minutes from 7 points ahead and almost save to now only 2 points ahead and the away-match in San Siro against Milan as next game. It will be a hard night for Malesani and the players. Tomorrownight Genoa plays at 20.45 hours in Luigi Ferraris against number last in the standings Cesena. An easy match ? No, in Italy doesn’t exist easy matches as we could see in the first match against Ceseana that we lost by 2-0 (2 goals of Adrian Mutu). Genoa misses tomorrow Belluschi, Antonelli and Constant because of injuries and Kucka because of his 8th yellow card this season against Novara last Saturday. Let’s hope we finally can celebrate a victory after 5 draws and 5 defeats. 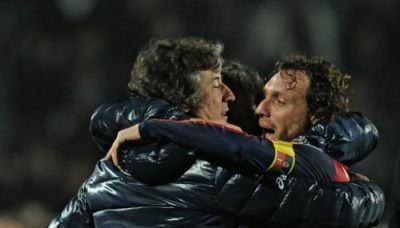 Again a draw while we alle hoped for the first victory since 5th February: Genoa-Lazio 3-2. Already in the 7th minute Genoa scored the openinggoal when Marco Rossi touched the shot of Rodrigo Palacio in the goal. During the first half both teams were equal, but after the break it seemed that Genoa was afraid to play. The equalizer of Mascara (ex-Genoa) halfway the 2nd half wasn’t a surprise. During the last part of the match Novara was the strongest team but our Rodrigo Palacio was the most close to a goal with a hard shot on the cross of the post and the crossbar. Because Lecce beat Roma by 4-2 we are now only 4 points above them. Wedsnesday-evening at 20.45 hours we play again: in Marassi against number last in the standings Cesena. Two of our most fisical players Kucka and Granqvist are back in the team and ready to play Saturday at 15.00 hours in Novara. In the very important match against nr. 19 in the standings Genoa only has to miss Antonelli and Constant because of injuries and Belluschi because of his red card against Inter. Mr. Malesani can be happy to have so many experienced players back in the team. Tomorrow Genoa travels by coach to train already on the synthetic field of the hometeam from Piëmonte with 4 ex-Genoani: Gemiti (our Genoano of the year 2003/2004), Paci, Mascara and Caracciolo (hired to Novara). This afternoon President Enrico Preziosi fired coach Pasquale Marino after 14 matches with only 13 points. The new coach till the end of the season is …… Alberto Malesani, our former coach that was fired a few days before Christmas after the 6-1 defeat in Napels. In the first half of the season Genoa had 21 points in 16 matches with Alberto Malesani, now in the last 8 matches we hope he can give us at least another everage of 1,30 points each match. The first match of Malesani is Saturday at the synthetic field of Novara. 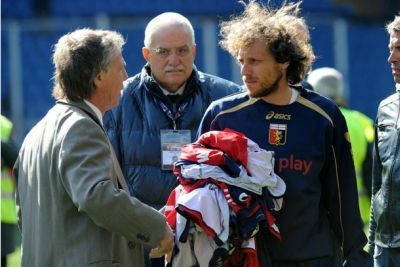 1st April 1992-1st April 2012: 20 years Genoa! 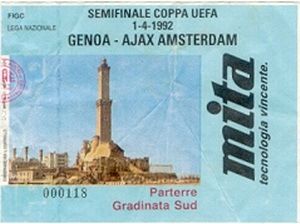 Today it is exactly 20 years since Genoa-Ajax, the first meeting with Genoa. This birthday deserved a victory today, but also a 5-4 defeat against Inter is memorable. 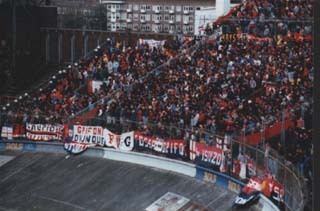 The love of Genoa started with the fans and the atmosphere in Luigi Ferraris, which still is the most important aspect in the relationship with Genoa. Below the article I wrote about the remarkable match 20 years ago in the semifinals of the Uefacup in the season 91-92. 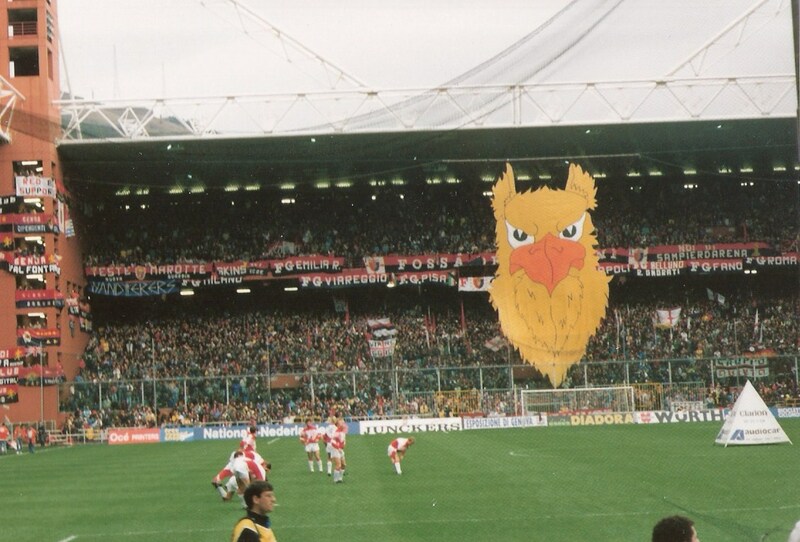 The history of Genoa Club Amsterdam starts at thursday 5th March 1992 when I see on Dutch televison the Genoa-fans clapping their hands to welcome the Liverpool-supporters that come out of their coaches. The Dutch commentator tells me that everybody expected a war between the Italian and English fans because of the Heysel-disaster in 1985. Liverpool plays for the first time after Heysel in Italy and whole of Europe waits for a battle between the fans, but everybody was wrong, so totally wrong ..
At friday 20th March 1992 I hear that in the semi-finals of Uefa-cup my favorite team Ajax Amsterdam has to play against Genoa 1893, indeed the team with the fantastic supporters. My wife and I decide immediately to book the trip to Italy. 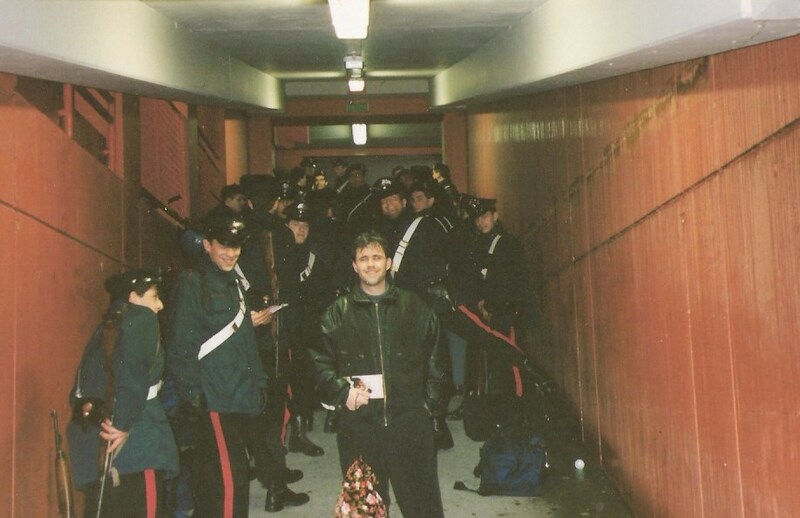 We follwed Ajax for years in Europa and went to many matches outside Holland including the finals in Athens in 1987 (Ajax wins Cupwinners Cup against Lokomotive Leipzig by a goal of Marco van Basten) and Strassbourg in 1988 (Ajax loose the final of Cupwinners Cup against KV Mechelen) but this will be our first match in football-country Italy. After a long trip by coach with lots of snow in Switzerland we reach Genova around 12 o’clock on Wednesday-morning, 6 hours before the match. The police leads our coach to the special sector for away-supporters and we have to stay around the stadium till the match begins, but we don’t care because the football-atmosphere is perfect. All of the city is coloured by the flags of Genoa (the most) and Sampdoria (less) and the people are, like we expected after seeing the welcome for Liverpool fans, very friendly. Two hours before the match it starts to rain, so we decide to enter the stadium. After the check by the police the dream begins: a fantastic completely red and blue coloured English-style stadium with a big yellow bird in front of the opposite site of the stadium (now I know it’s the Griffin) and all the people are constantly singing and very enthusiastic. Of course we don’t understand a word of them, but for the first time in my life I agree with changing my scarve with a supporter of the other team. This is real football-fever …. The match is fantastic and both teams want to attack, something which is surely not common in modern football. Ajax wins in the last minute and steals the victory and we all are waiting for a battle with Genoa-fans after the match because they lost such an important match at home in the last minute. But the battle never starts, people stay friendly and we do not keep an eye on the 50 Sampdoria-fans that are outside our sector to try to thank us for the victory. No thanks ! Two weeks later at the day of the return in Amsterdam, my wife that works in an office in city-centre calls me several times that there are constantly canal-boats with hundreds of enthusiastic singing Genoa-fans on the canal in front of here office. A fantastic view and she feels sorry that she does not have a fotocamera to make some pictures. Later that evening the match ends in 1-1 and Ajax goes to the final against Torino. The Genoa-dream is over, but already at that moment we are sure that we will never forget those crazy enthusiastic red and blue fans.